I come to you. I pack up my kit, filled with the highest quality products and tools, and meet you in the comfort of your own space. I correspond thoroughly to truly understand the look you desire and what you are comfortable with. I provide guidance, honesty, and artistry. I aim to make your vision come true, creating a look that is truly you. I offer trial runs to ensure that your vision comes to life in a way you love. If there is something you want to adjust, I work with you until you are happy with what you see and how you feel. I develop a customized and perfectly tailored timeline based on your exact needs for the day. Please contact for a full pricing list and customized pricing. LULA is mobile. I come on site for any occasion - photo/ video shoots, weddings, or special events. Travel within a 40 mile round trip is built into your cost, and a travel fee will be developed for locations outside of 20 miles from downtown Raleigh. Travel charges help cover the cost of gas, mileage, and added time for myself and my assistants. For smaller events such as trials or consults, I often host at my home in downtown Raleigh. I love using products that are clean, non-toxic, and high performing, such as Beauty Counter, Tata Harper, 100% Pure, Juice Beauty, and Jane Iredale. I do not use anything on my clients that I would not wear myself, taking into account longevity of wear, flawlessness of the look, scent, feel, and effects on the skin. 3. What do you do for sensitive skin, or skin prone to breakouts? I really love working with you to create a look you love, and a look that will not aggravate your skin in any way. While I aim to purchase products that are clean, non-toxic, and non-irritating (such as Beauty Counter and Jane Iredale) I am also more than happy to use any products you already own which you know work well and do not aggravate your skin. I will also add some LULA flair with my own products and techniques to achieve an enhanced look. 4. Do you have assistants for large bridal parties? I am thankful to work in a talented community of stylists in the Raleigh area who often join me for larger weddings. These are not LULA employees, but are contracted stylists with their own businesses, skills, and unique aesthetic. The more women receiving services means more stylists - which means a faster pace and more crowded space. I try to set realistic prep expectations for you, because I want you to have a peaceful morning on your wedding day! The number of services are decided on well ahead of time, I develop a timeline to accommodate all the women in your party, and we'll try to make it as comfortable as possible. 5. How long does it take for hair and makeup? I schedule 40 minutes per service (40 minutes per hair, 40 minutes per makeup, or 1 hour and 20 minutes for a complete look). This allows me to truly provide the quality of service you are paying for, taking into account your individual needs and achieving the most enhanced, personalized look for you. There are many factors which affect this time - it naturally takes longer to style very thick hair than thinner or shorter hair, and applying false lashes or doing a very "done up" makeup look will take longer than achieving a more natural look. Small spaces also affect the time and quality of service, so be sure to keep this in mind when planning for your day. Plenty of space helps me do my job to the best of my ability, and allows you to have a more comfy and enjoyable time! 6. Do you offer airbrushing? I do not offer airbrushing, but instead prefer using traditional makeup application. This gives me a little more control over the exact brands I like to use for different skin types and looks, and a little more artistry in the application. I will make sure you get a smooth, flawless base for your face! 7. Do you offer trial runs? Yes I do! 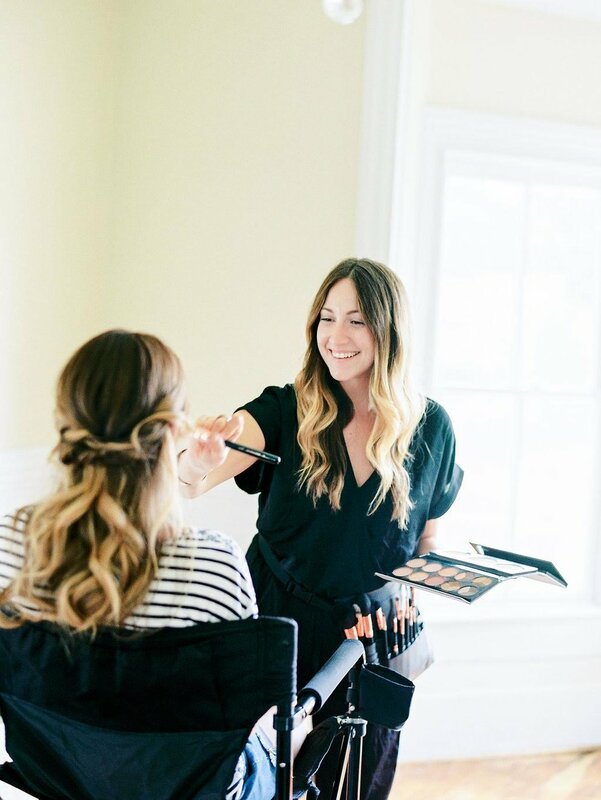 Trials are a great way for us to meet prior to your event, to see how you like the services, to get a good vision of your desired look on you, and see how you like the makeup/hair throughout the day. I charge separately for trials, and often host these at my home in downtown Raleigh. I like to schedule 2 hours for a full hair and makeup trial, or one hour for just hair or just makeup. This allows time for me to assess your skin or hair needs, to try out a few looks if needed, and make a hair/skin plan prior to your event.